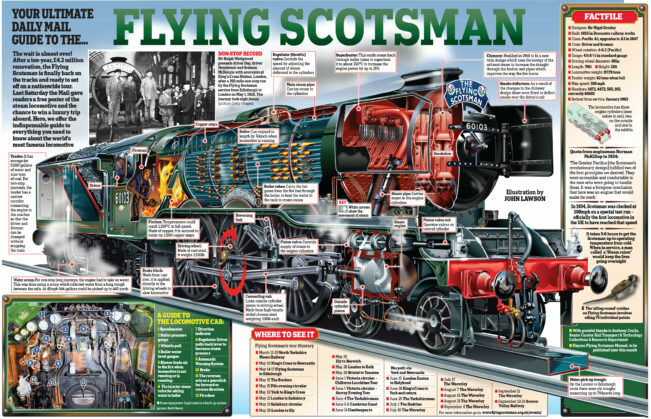 To illustrate the workings of the Flying Scotsman locomotive after a £4million renovation, John Lawson designed this amazing infographic for Daily Mail. The locomotive set two world records for steam traction, becoming the first steam locomotive to reach 100 miles per hour (160.9 km/h) on 30 November 1934. It then set a record for the longest non-stop run by a steam locomotive when it ran 422 miles (679 km) in Australia on 8 August 1989.